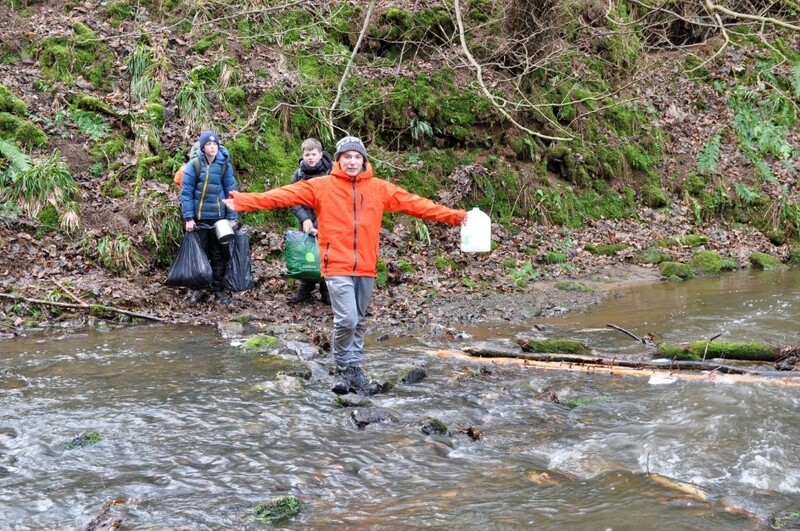 Seven Scouts and one Explorer from Bonnyrigg took part in an Extreme Survival Camp over the weekend 8-10 February. Five of the group assembled at Currie Wood, across the river from the Midlothian District campsite at Borthwick, on the Friday afternoon. 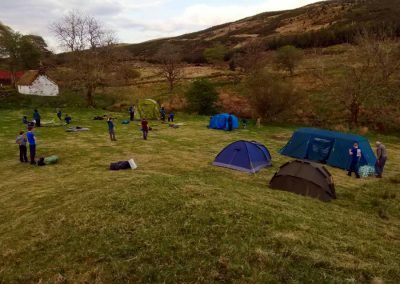 Leaders Peter Hyde from Bonnyrigg and Adrian Marchant from Penicuik were on hand to show the Scouts how to survive the weekend without many of the camping aids which Scouts might take for granted. The first task was to build a shelter for the night by stretching a rope between two trees and covering it with a tarpaulin to make it keep those sleeping under it dry all night. Then the Scouts were shown how to start a fire without matches and they soon learned to gather enough wood to keep it going in order to cook their dinner and keep them warm all evening. Dinner was squirrel which was supplied by a specialist game dealer. 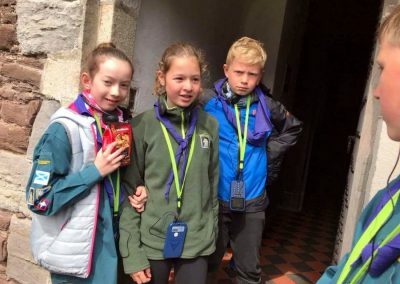 The Scouts were shown how to prepare the squirrel and cook it into a stew with vegetables to make a good evening meal. Fortunately, they managed to achieve this during daylight hours although this meant that the rest of the evening was spent keeping each other’s company around the fire until an early night beckoned. 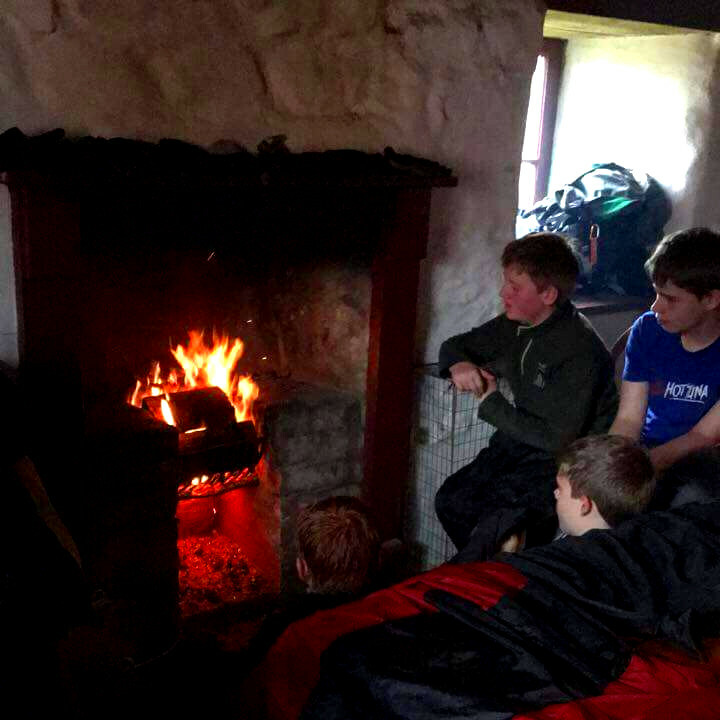 Saturday morning saw a 6am start with the fire restarted and breakfast underway. 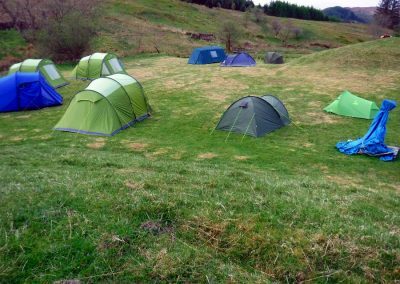 Striking camp, the Scouts had to work out how they were going to walk cross country to Saturday night’s campsite on the edge of Fala Moor. The Scouts set off in good heart and hiked across farmland for a distance of 4 miles. 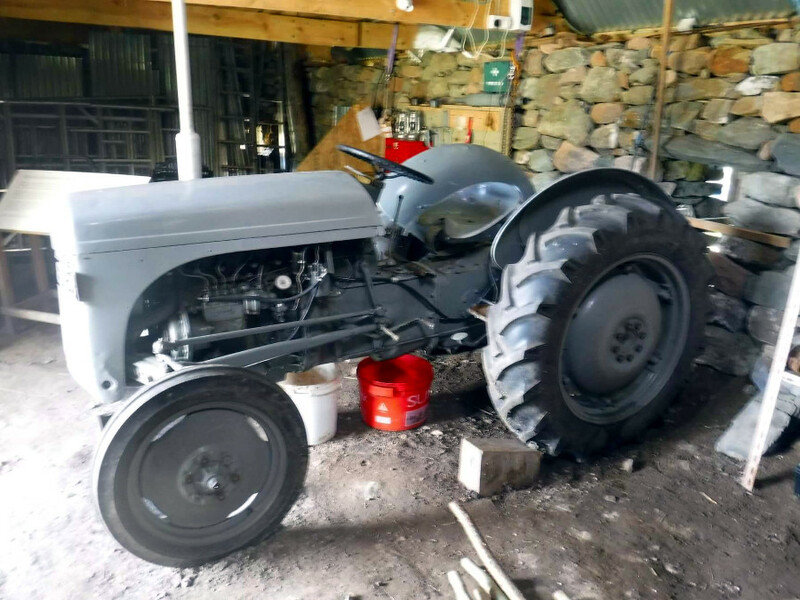 Permission had been obtained from the farmers en route and at least one helped the Scouts on their way. Arriving at the edge of Fala Moor the Scouts found that their second night’s campsite was in a forest with plenty of tree cover. This time the Scouts could choose to bivouac under the trees and together they set up camp in the forest. Three more Scouts joined the group for the Saturday night. One 10-year old had only been a Scout for three weeks and this was his first camp. Leader Erika Pryde from Bonnyrigg also joined the group for the second night. Two fires were quickly lit and dinner prepared. On the menu tonight was woodpigeon which was prepared after instruction from the leaders and cooked into a stew with vegetables. S’mores followed for dessert and the fire. 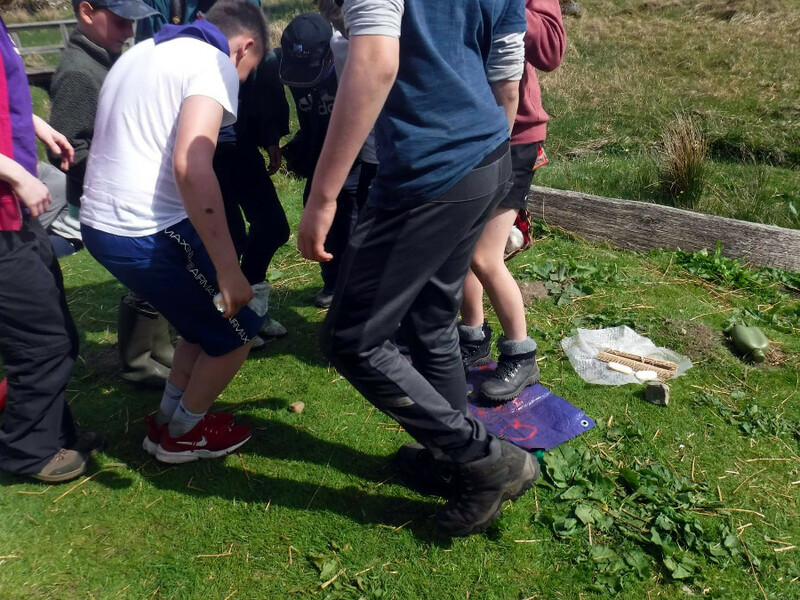 Scouts quickly learn that a spoon does nearly everything! Dinner was interrupted by a visit from the District Commissioner who found the 8 young people in good heart and enjoying their survival experience. The Scouts found that this sort of camp is very demanding at times and at other times, especially in the evening, they had to amuse themselves as a lot of time was spent doing nothing. None of this deterred any of the Scouts from enjoying the experience. 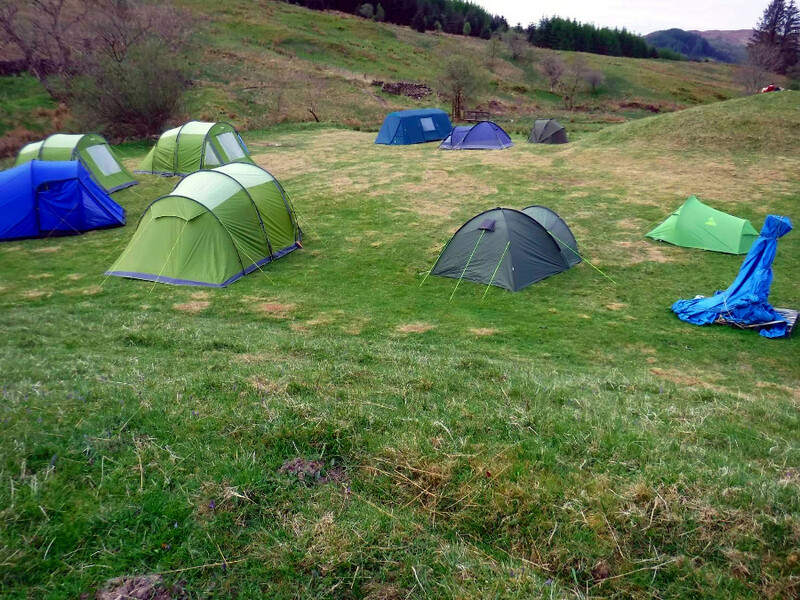 The Scouts all learned essential survival skills over the weekend. They camped outside without tents, used knives to gut and prepared meat for stew, and they learned to light fires without matches. 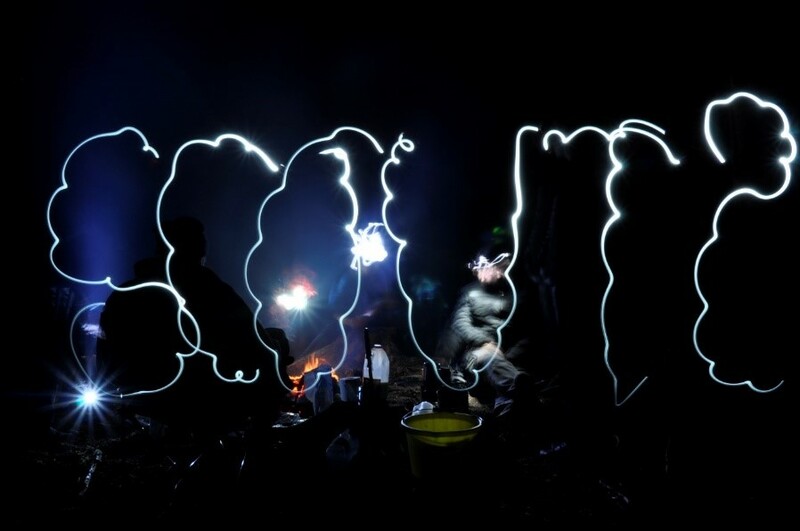 They planned their route across country to wild camp on the Saturday evening. The weather was kind to the Scouts this year but in past years the camp has taken place in several feet of snow. Who knows what weather next year’s camp might experience? The Scouts learned how to keep warm and dry and also the importance of gathering sufficient wood to keep a fire burning. Water is a precious commodity which had to be collected and used sparingly. 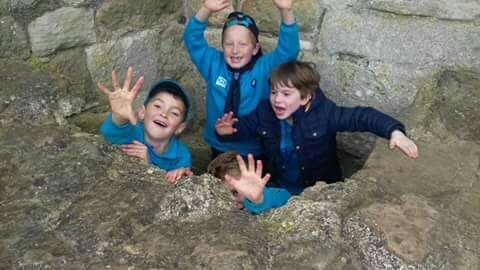 The Scouts learnt a lot and were encouraged to think outside the box. Information came thick and fast and the Scouts were encouraged to bring a small note book and pen for the day when they find themselves teaching these skills to other Scouts. Peter still has his notebook from his survival skills training and he still refers to it regularly. Auchindrain – the field of the blackthorn tree. 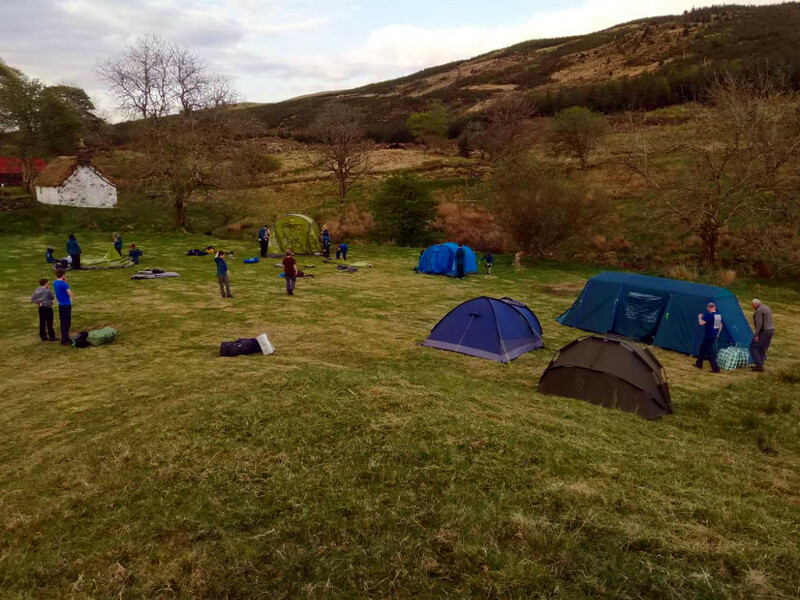 Who could imagine that a group of 10 – 15-year-olds would be demanding that the Auchindrain camp stays firmly fixed on the 14th Midlothian (Bonnyrigg) Scouts calendar? After eight years this is still one of the most popular camps – it has to happen in May on the Victoria holiday weekend because it is such a long way from home, and the only way to get there is by mini bus, there are no local trains and the bus journey to Oban and on to Inveraray would take the whole day. 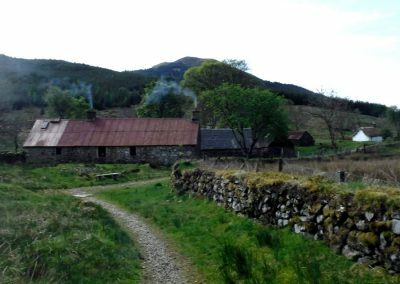 Auchindrain is the most complete Highland farm township in Scotland. 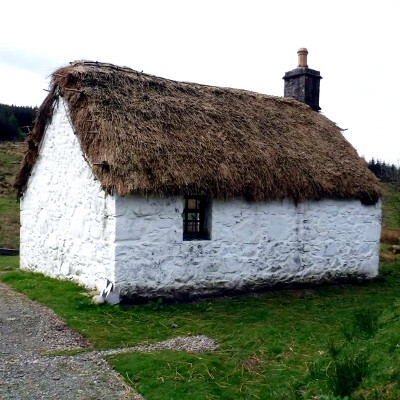 It survived the Highland Clearances and has now become a category A listed building. 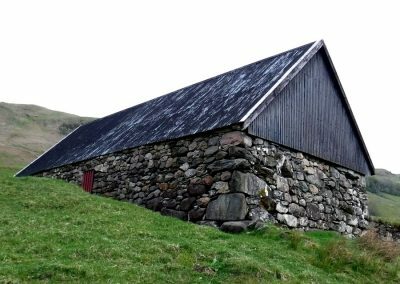 Although building is the wrong term as there are a number of buildings and more being discovered each year. Bonnyrigg Scouts have been privileged to be a part of this. 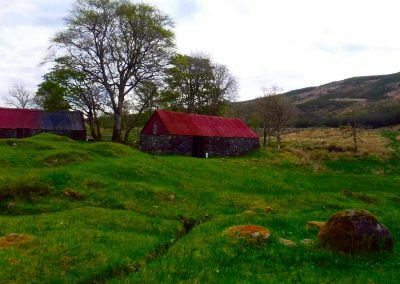 The Township lies approximately six miles south of Inveraray in Argyll It is typical of settlements of its kind 200 years ago. Eight years ago following a random conversation between the Scout Leader and the handyman at the site Bonnyrigg Scouts were invited to camp and experience life in the Township as part of what was then the local history badge, they duly turned up and pitched camp, met the curator and learned the Gaelic equivalent of their names and what they meant, they worked all day Saturday on the site helping to remove old fencing and make the site secure for the heritage sheep that were to be moving in, they planted 1000 tiny tree seedlings on the edge of the forestry commission plantation and tried keeping the peat fire going in one of the old dwellings. 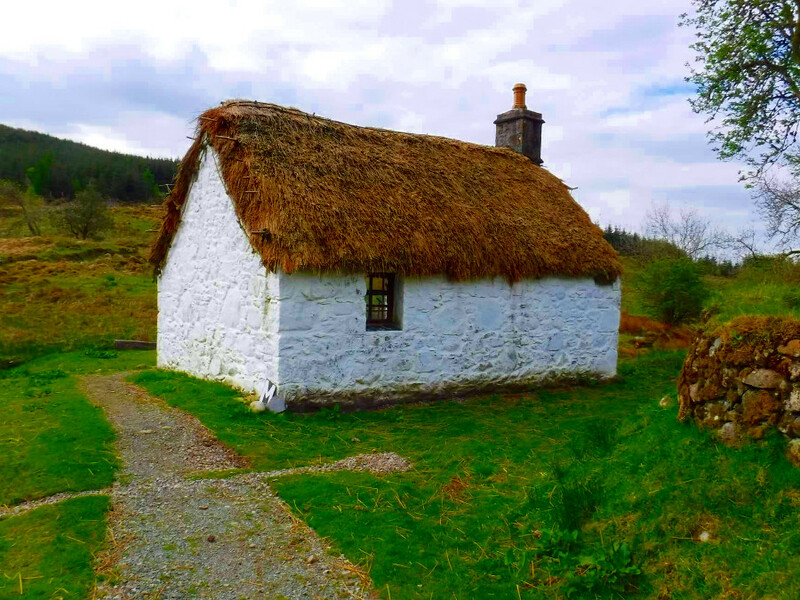 On the Saturday night they met a local Free Church minister who led a traditional Highland service of sung psalms and read from a Gaelic bible – a new experience for everyone! 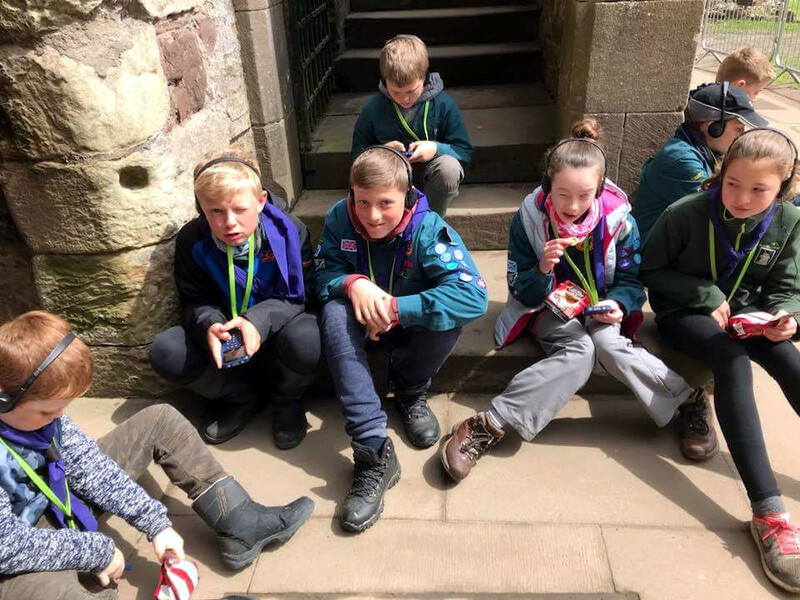 Scouts explored the local hills and woods on a hike on the Sunday and finished their visit with a trip to Inveraray jail, luckily no one got locked up. 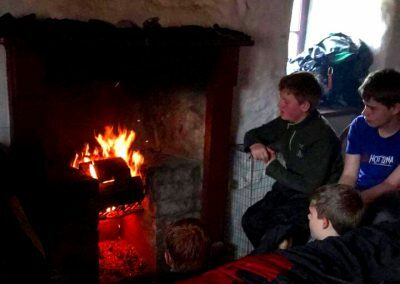 This started a tradition of visits with Scouts learning skills such as waulking the cloth with the weaving group, making butter in traditional churns, cooking on the peat fires, whitewashing walls, stone harvesting the tattie field, joining in games of shinty, looking after the rare-breed hens, exposing former access tracks and paths within the site, forming drainage ditches and helping Cathy build a traditional travellers’ “tent” from willow and canvas. This year the Scouts were able to take part in the digit2017 project managed by the Society of Antiquaries of Scotland. This involved the continued excavation of work begun in 2017 to excavate and unravel the story of Building T – until last summer a completely unknown building. The Scouts explored the infill of the building scraping back the weeds and soil to expose the original floor, retrieved small finds which included boots, teapots, broken china and a various glass bottles. The Scouts also helped to rebuild the original walls using the stone pushed or fallen into the building, learning how to drystone and, in the process, why not to climb on drystone dykes! 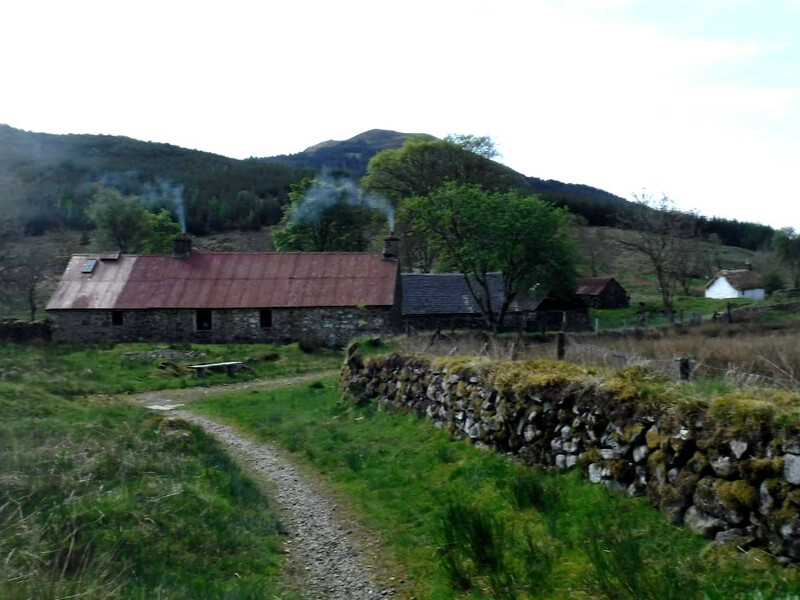 The finds were washed and catalogued ready to be included in the inventory of Auchindrain. The weekend is not all work however and between times the Scouts were taught how traditional dyes were made for woollen clothing, how to card tease and spin wool, they learnt a number of weaving techniques and how to make felt. Cooking and eating of traditional foods was a firm favourite – what a difference having to cook on an open peat fire on a griddle! They weren’t keen on a totally traditional menu though the idea of sliced cold porridge for breakfast and lunch wasn’t well received so instead we cooked Orkney bannocks, fish cakes, drop scones and flatbreads, topped with butter churned in large kilner jars YUM! 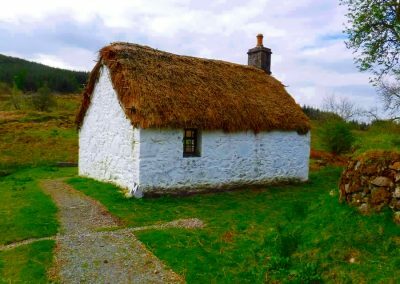 Meals were based on the food that would have been available to the residents at Auchindrain although we ate more protein in one weekend than they would have shared in a month between all the families! On Saturday night a traditional Ceilidh was held in the Barn with a little bit of dancing and plenty of singing with guitar and piano accordion, historically this would have been when the local news was shared by travellers moving from one place to another selling, fixing and exchanging tools, special foods or other items. 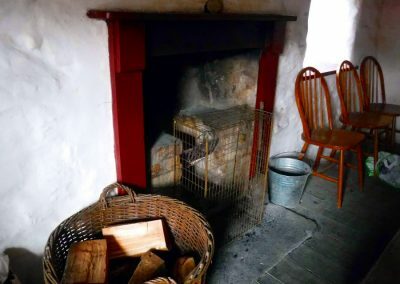 At night groups of Scouts took it in turn sleeping on the old cot beds in Martin’s house – although they used sleeping mats and sleeping bags rather than the straw paillasses and scratchy woollen blankets, and torches rather than candles and oil lamps. 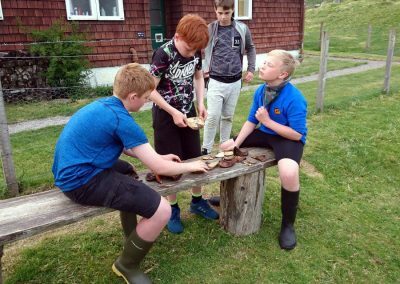 During our time at Auchindrain this year the Scouts also contributed to a series of blogs following their experiences at the site and detailing the things they found in their archaeological dig contributing to the year of Young People Visit Scotland initiative and their public relations badge work. Traditionally at Auchindrain the group calls in to another visitor attraction in the local town and delights in the offerings of the wee sweetie shop where cremola foam, candy stick ”cigarettes”, gold bullion gum and giant gobstoppers can still be found, fortunately for the leaders Inveraray also hosts a very nice tearoom with homemade cakes! On the return journey we have made a further tradition of calling into a visitor attraction that shows a totally different lifestyle to the township, in the past we have visited the jail and Inveraray Castle (where a great number of the people from the township went to work as servants and agricultural labourers), Stirling Castle and Doune Castle where the recent television series of Outlander has been filmed, and made famous by the Monty Python film “Holy Grail”. By the end of the Auchindrain weekend the Scouts are able to gain their local knowledge badge (history) and have carried out site service as part of the outdoors challenge but they have learnt far more about the hardships and the lives of Scots ancestors, changes to lifestyles that have occurred in the relatively recent past, they have cooked traditional meals and learnt traditional skills. 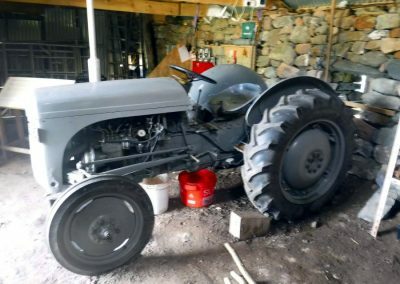 Over the years that we have been going to this camp, the Scout Group have made a tremendous contribution to the museum, carrying out work which there would not be time for in the general running of the site. Visitors to the site have been impressed by the attitude and work of the Scouts and many have commented on the help the Scouts have given them in understanding the history of the site. We look forward to the new things we will be learning next May! 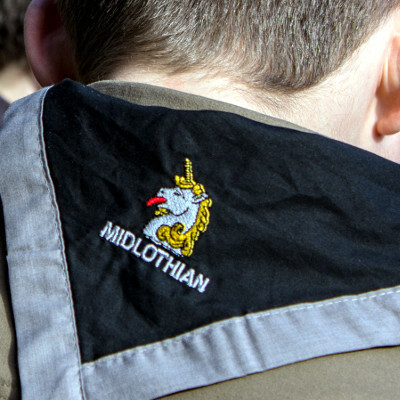 We now need a brilliant volunteer manager to take Scouting forward in Midlothian. 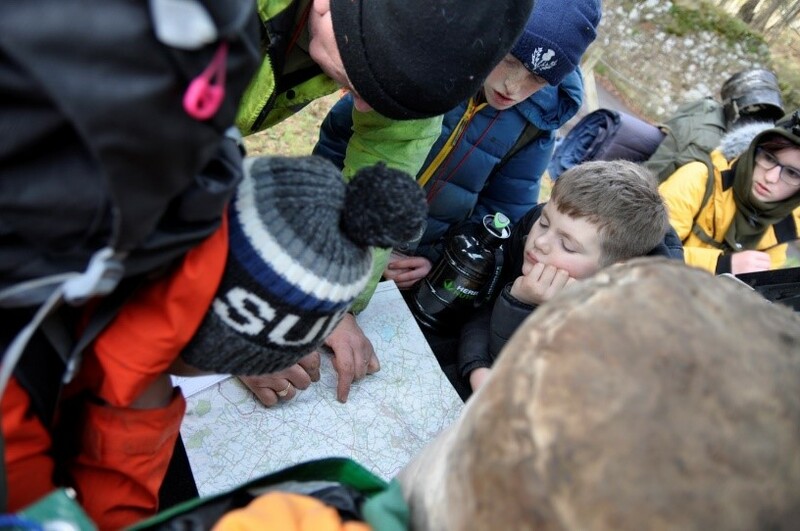 As District Commissioner you will offer support to Scout Groups, while helping open new ones. You will manage adults, setting objectives and holding regular one-to-ones. 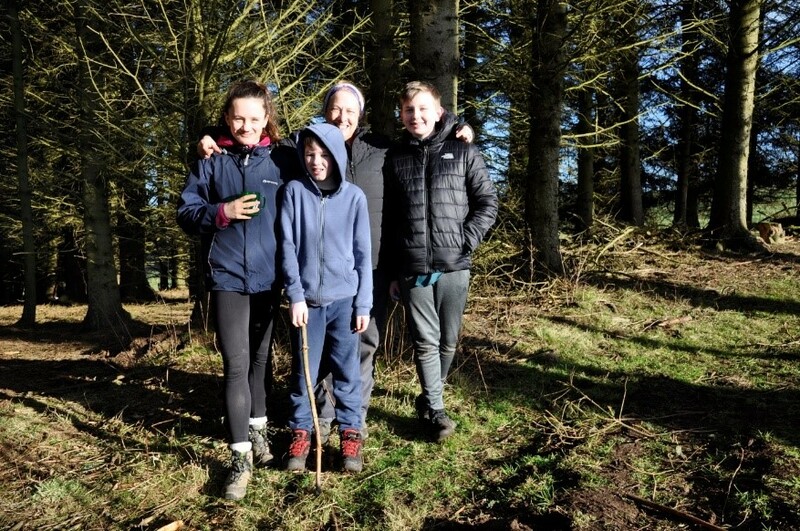 Most importantly, you will ensure that Scouting offers an enjoyable and attractive programme for young people in Midlothian, helping prepare them for a bright future. Although no Scouting experience is necessary, you will know how to motivate people and produce a local development plan and you will have the charisma to inspire your team. And you will be well supported by the Regional Leadership Team. 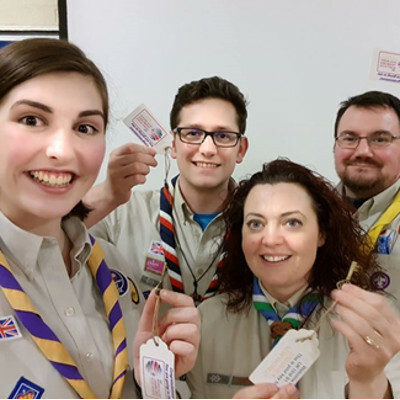 Above all, you will believe passionately in Scouting for All: helping Scouting grow, become more inclusive, more youth-shaped and make a positive impact in local communities. It’s a challenging role, but the rewards are huge, improving the outcomes for thousands of young people. Scouting offers fun, friendship and life-changing adventure to over 7,200 young people in South East Scotland Region. But this is only made possible by our talented teams of volunteers – and we hope you will become one of them!